Well, maybe not that big. Because we’ve tried to make all of our courses as affordable as possible. What do you get? 40 hours of online training for $250. Deep discounts on live training classes. Yes, you read that right. That’s $6.25 per hour of online training. It’s actually less than that, because you’ll get immediate access to any newly-released content as well. Of course, if you don’t need that much training, you can purchase all of our courses individually. What about live training events, you might ask? Because there are hard costs to hosting live training events, we can’t give you those for free. But – All-Access Pass holders get deep discounts on all of our live events, usually around 50% OFF! This is a one-year agreement – you pay $249.99, and you get access to all of our online courses (and deep discounts for live courses) for one year. At the end of the year, you have the option to discontinue your subscription or sign up again for another year of access! 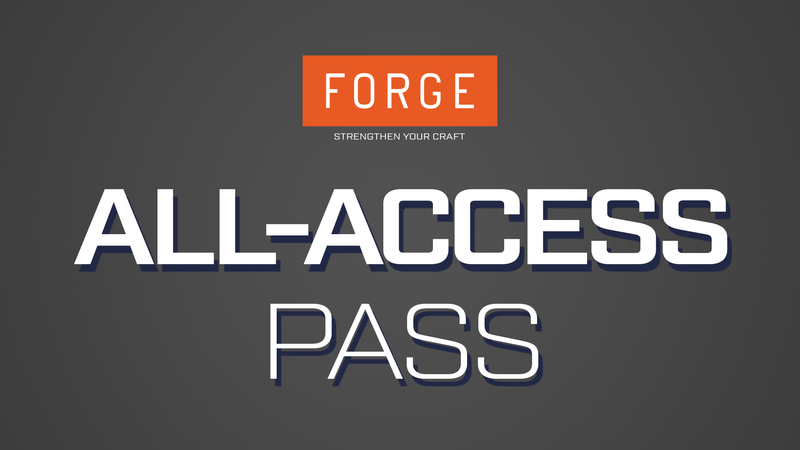 Access all our current and future FORGE courses. Billed annually.